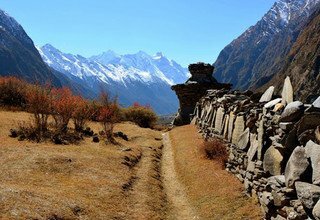 Rupina La Pass and Tsum Valley Trek is the peaceful gem of a trekking adventure that takes you deep into the Manaslu region and offers unparalleled natural riches. The trek glides on the lesser visited trails promising mind-blowing adventure and glorious views. You will get to witness breath-taking views of mountains like Ganesh Himal (7,422 m), Mt. Himalchuli (7,853 m), Mt. Manaslu (8,163 m), and Shringi Himal (7,161 m). You will also get to experience the unique culture, tradition, lifestyle, food, and dances of locals. 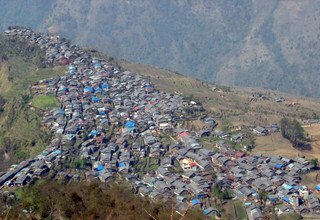 Rupina La Pass and Tsum valley camping Trek begins from the Kathmandu and take you to Gorkha, an ancient town of Nepal. 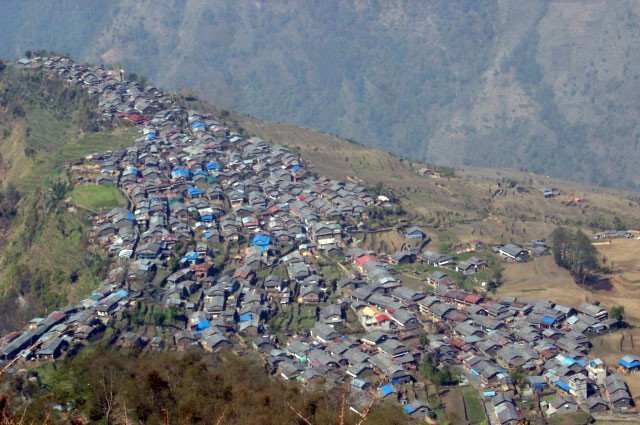 From here, you reach Barpak Village, where the prevalent residents are the Gurung community. You will then go through Gai Kharka, Rubina la Phedi and passing the Rubina la Pass at an elevation of 4,720 meters. You will find yourself in a peaceful environment with gargantuan peaks keeping watchful eyes over you. Relishing the enchanting views, you begin the descent. You will then cross the Budi Gandaki River and reach Tsum Valley. Further, you will descend towards Jagat and cross Machha Khola to reach Arughat Bazaar. You will get to interact with the locals here. From here, you will take a private tourist vehicle that will take you back to Kathmandu, and your trip ends here. The trail will be difficult and strenuous on many sections. This trek will lead you to the region where you will not see any single human settlements for continuous five-six days. The trek is a magnificent opportunity to witness the Himalayas with the inhabiting floral and faunal abundance. Additionally, the rich cultural heritage and heart-warming hospitality make this trek a must-go-to. The best times to go on this trek is from March to May and September to October. We are working in the travel and tour industry for years now. With over 12 years of experience and expertise in complementing our excellent transportation and accommodation services, we are one of the best choices for you to make your trip unforgettable. We also provide English-speaking guides to lead you throughout the journey. You will arrive at the Tribhuvan International Airport. One of our team delegates will be at the airport to pick you and take you to our hotel. After reaching the hotel, you will freshen up and rest. Overnight at a 3-star hotel in Kathmandu. You will go on a guided tour of the Kathmandu Valley. You will visit the famous monuments like Pashupatinath Temple, which is the holiest temple of Hindus, Boudhanath Stupa, Swayambhunath, also known as Monkey Temple. These sites are also enlisted as world heritage sites by UNESCO. They reflect the art, culture and architectural prosperity of the valley during the olden times. Overnight at a 3-star hotel in Kathmandu. You will drive to Gorkha today. The drive will be around five hours long and offers you scenic views of hills, small villages, pastures, and forests. You will reach the ancient town of Gorkha where unification campaign of modern Nepal was first started by Prithvi Narayan Shah, in the 18th century. You will visit the ancient palace and explore the area. You will stay overnight at the camp. Today is your first day of the trek. You will go through rice fields, numerous bananas trees, and several small villages to reach Baluwa. On the way, you will also get glimpses of snow-capped mountains. After taking a short break near a glacial river, you continue ahead on the journey. The trail will not be tough but, the hot weather might exhaust you. You will stay overnight at the camp. 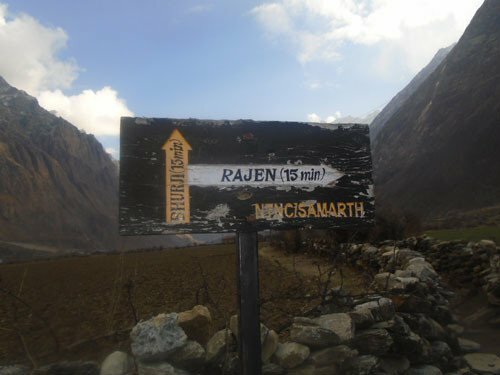 You will begin trekking towards Mandre Village leaving Baluwa behind. You will walk on the steep trail and further go through a dense forest. You will reach a small plateau where you will take a short break to have lunch. You will then ascend towards the steep hill along with the views of massive peaks covered in the snow. 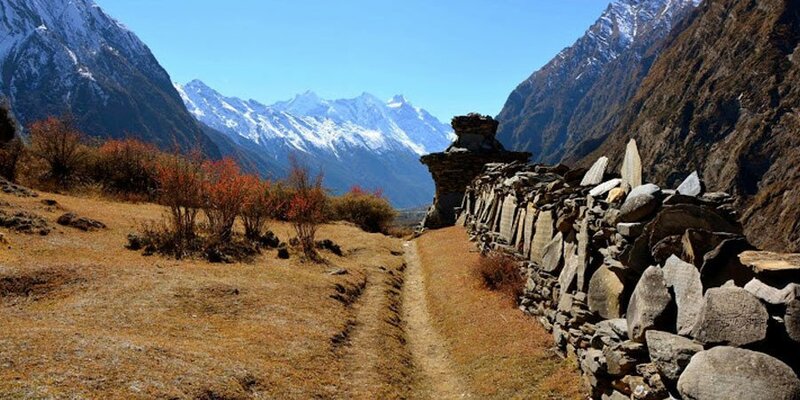 You will reach Barpak and walking through the big center market, you will trek towards the terraced pasture. Stay overnight in the tent. From today, you will not get to see any villages for the next few days. You will descend down to the river and cross it, and move towards Rupina La Pass. 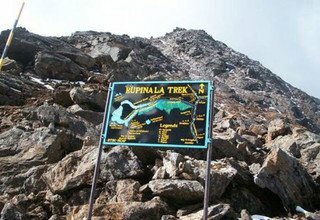 You will cross the Daraudi Khola and ascend through a different vegetation and climatic condition. Further, you will go through the pine forest and enter the alpine meadows. 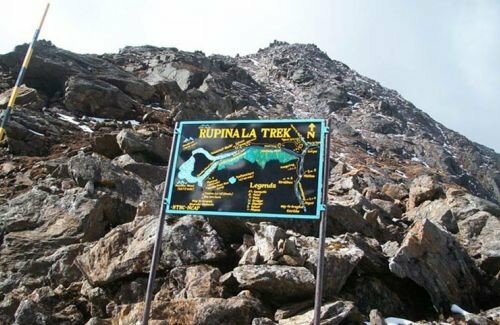 You will ascend to reach Rupina La Base Camp (4,000 m). You will stay overnight at the camp. You will begin trekking early in the morning with the breath-taking views of the mountains. You will begin descending, which is tougher due to the rough steep path. There may a few times when the visibility might not be so good, so you have to be careful. After reaching the Kharka, you will relax and stay overnight at the camp. You will descend down the hill towards the Buddha Himal Glacier. You will cross beautiful meadows and a river on the old rustic bridge. You will ascend steeply through the dense pine forest. Upon reaching the glacier, you will walk on the trail with boulders which are piled randomly and can be very unstable. Further, you will climb on the other side of the glacier and descend through the pine forest to reach the valley floor. You will stay overnight at the camp. You will descend down the valley crossing the big grassy slopes. You will see stunning views of Ganesh Himal (7,422 m). You will descend to the Budhi Gandaki Khola and further, ascend towards Tsum Valley. You will trek on the rocky slopes and then enter the Nyak following a trek down through the pasture to reach your campsite. You will get to interact with the villagers and see their lifestyle. You will stay overnight at the camp. You will begin descending down to the river and again ascend from here. The trail will be tiring as it goes through the stone and dirt path and takes you down to the mountainside. You will reach the main trail along the side of Budhi Gandaki and further, cross a suspension bridge over a river. You will now trek towards the Lokpa Village. You will stay overnight at the lodge. You will begin descending through the forest and cross a stream on a bridge. You will then ascend steeply on the stairs and trek on the north side through the rhododendron and pine forest. You will then descend towards Bhatti Ghumlong and again ascend steeply to Ripchet. You will cross the Siyar Khola on a dangerous wooden bridge and ascend towards Chumling. You will stay overnight at the lodge. You will begin trekking by crossing the suspension bridge and go through the field of potatoes and maize. You will see beautiful views of Ganesh Himal (7,422 m) and its neighboring peaks. Further ahead, you cross a long suspension bridge and Serpu Khola to ascend gradually and finally arrive at Chhokang Paro Village. If the weather is clear, you will get to see amazing views of Mt. Himalchuli (7,893 m) from here. You will stay overnight at the lodge. You will head was through the small villages and ascend towards a ridge and reach to the huge courtyard of the Rachen Gompa (3,240 m). You will then ascend and visit Milarepa’s Cave and further, cross the Siyar Khola. You will go through the hamlets of Phurbe and Pangdun and reach the Chhule Village. You will then trek towards the upstream to cross the bridge and ascend to the Nile. You will stay overnight at the lodge. You will wake up early in the morning and trek along the west bank of the river. You will ascend to the huge Mu Gompa with the beautiful views of Chortens and Tibetan mountains. You will also visit Dephyudonma Gompa on the way and return back to the Chhule. Further, you will continue trekking until you reach the bridge on the west bank. You will cross the bridge and descend down to Chhokang Paro. You will stay overnight at the lodge. You will descend to reach a small gompa at Gho. Further, you will walk down on a narrow trail through the village and cross a wooden bridge over Siyar Khola. You will then cross a bridge to reach Dumje, and ascend steeply through rhododendron and pine forest. From here, you will climb on the zigzag steep path and reach Gumba Lungdang. Overnight in Gumba Lungdang. 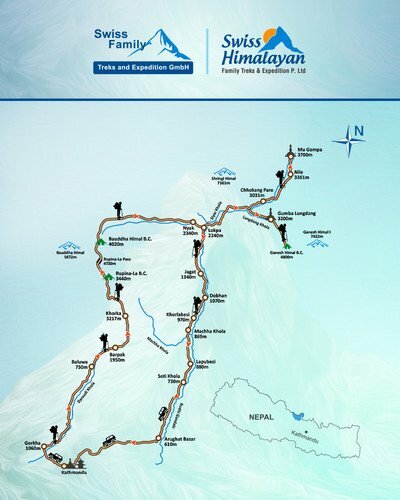 You will go on the day trip to the Ganesh Himal Base Camp (4,200 m). You will descend through the muddy zigzag path and ascend towards a valley through the forest. You will then cross Landang Khola on a wooden bridge and ascend steeply through rhododendrons and pines. 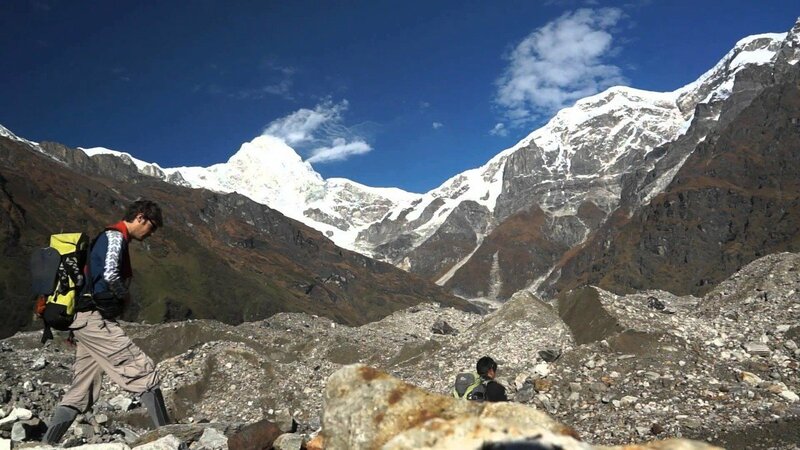 You will then trek and reach he Toro Gompa glacier and climb further to reach Ganesh Himal Base Camp (4,200 m). 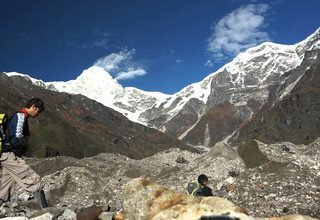 After spending some time at the base camp, you will return back to the Gumba Lungdang. You will wake up early and descend towards Dumje. You will cross Langdang Khola and ascend to Ripchet through a deep gorge and unstable bridges. You will see the beautiful fertile valley of buckwheat and barley with ancient Chortens surrounded by the pine trees. Further, you will descend steeply on the stairs to the Bhatti Ghumlong. From here, you will ascend through the forest and reach Lokpa. You will stay overnight at the lodge. You will descend down towards Philim. You will then trek along the Budi Gandaki River and after few ascends and descends, you will reach Philim. Further, you will descend down, and cross a long suspension bridge over Budi Gandaki River. You will then reach Sirdibas passing through the Gatte Khola. From here, you will go through small villages, and trek on the rocky path to reach Jagat. You will stay overnight at the lodge. You will descend down to the lower Jagat and trek on the rocky path. You will then cross a suspension bridge and descend down through the forest to reach Yarubagar. You will trek on the rocky trail and walk down through the forest. Further, you cross numerous rivers on multiple occasions and reach Machha Khola. You will stay overnight at the lodge. You will begin trekking by descending the hill and trek along the sandy riverbed to reach Khorlabesi. You will then cross the rice terraced field and ascend to the side of the cliff. The trail is full of rock walls and further, you will ascend on to a ridge. You will reach Soti Khola after passing through several sal forests and crossing a suspension bridge. You will stay overnight at the lodge. Day 21: Drive from Sotikhola to Kathmandu by private land cruiser and transfer to Hotel. Today, you will drive back to the Kathmandu on a private tourist bus. The route will go through the dusty newly built road to Arughat Bazaar. From here, you will drive towards Gorkha Bazaar with the views of Ganesh Himal ranges and reach Kathmandu. Upon reaching Kathmandu, you will be taken to our hotel. Overnight at a 3-star hotel in Kathmandu. You will wake up early and have breakfast. After that, you will check-out at the hotel, and one of our team members will take you to the airport for your flight back to your home. * Sightseeing tour as per above mentioned itinerary and entry fees. * Meals (breakfast, lunch and dinner) with Tea & coffee and hot/cold filter water during the camping and lodge trek. * Camping/Tented and lodge accommodation during the trek. * Manaslu and Tsum Valley Restricted Area Permit.